The Achilles tendon is a large ropelike band of fibrous tissue in the back of the ankle that connects the calf muscles to heel bone. Contraction of the calf leads to the Achilles pulling on the heel allowing you to point your foot or walk on tip toes. An intact Achilles is vital to such activities as walking, running and jumping. Ruptures normally occur in middle age male athletes. Most tears are complete, partial thickness tears are rare. Injury often occurs during explosive activity such as jumping, running or sudden push off. Most patienst report sudden pain at the back of heel or calf. A snap or crack may be heard or felt. A lot of patients feel they have been kicked from behind. Initially there is pain, weakness and swelling. A gap in the tendon may be felt. Usually the diagnosis is made by your GP or physiotherapist based on your history and physical examination. Other tests such as Xrays or MRI scans are usually not needed. Often patients will undergo an ultrasound. Non surgical treatment: cast or splint. Surgical Treatment: surgery to repair the tendon. The aim of both treatments is to restore the Achilles to the same length and tension and thus restore function to as normal as possible. Health of patient: smoking , diabetes, poor circulation Sporting demands. Surgery has been the treatment of choice for the competitive athlete or those with a high level of physical activity, for those with a delay in treatment or diagnosis, and for those whose tendons have ruptured again. A cut is made on the back of the ankle to expose and then repair the tendon. The tendon ends are sewn together. 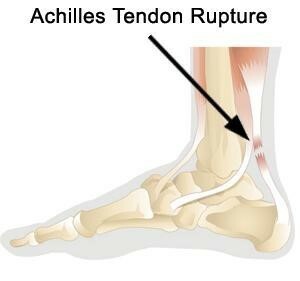 These repairs are inherently weak and for a good result the tendons will need to heal themselves together. The repair supports the natural healing process. Reapir as soon as swelling has subsided Normally I night stay in hospital. Plaster half cast for 2 weeks. Strict elevation, non weight bearing with crutches. Review by Dr Hewitt at 10 -14 days. Review of wound and change to hinged ankle brace. Brace locked at 30 degrees planter flexion for 2 weeks. Brace changed to 15 degrees for 2 weeks. At 6 weeks post op brace changed to a right angle and allowed to fully weight bear with crutch support. At 8 weeks post op see Dr Hewitt and then remove brace., Begin physiotherapy. Scars: Every incision results in a scar, in some situations these may be prominent. Eg . keloid scar. Deep vein thrombosis: These may lead to swelling and pain or be life threatening. – Wound breakdown: 5% dependant upon health of patient this can be a very severe problem requiring further surgery. – Infection 5%: similarly a very serious problem id occurs. – Re rupture : 5% , if occurs will require revision surgery. If you’d like to download a PDF of this information, click here.